August 26th -- Share the best book that you read over the summer break. 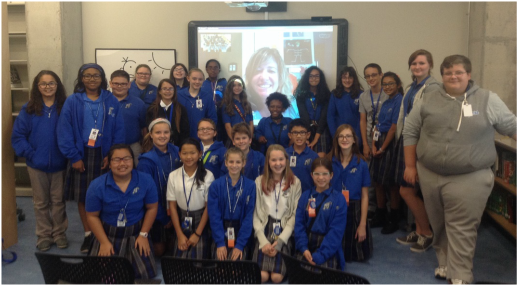 September 30th -- Skype with Flunked author, Jen Calonita. This was the last BRiMS meeting of the school year. Unfortunately, it fell during testing week, and the schedule was out of whack. Half of the members forgot to attend. Those who did make it enjoyed the gummy worms that we ate to celebrate the sludge that the trolls fed to Rump. It was a treat comparing Rump to the original fairy tale of Rumpelstiltskin because Shurtliff's novel did such a good job of explaining the whys of the fairy tale: why he went to the tower to see the miller's daughter, why he ended up with the baby, and why he could only share the gold he made when a bargain was struck. The book also painted Rumpelstiltskin as a sympathetic character, and that was a highlight of the story for BRiMS. For those who did not read the book, we spent some time talking about names and how they fit or don't fit a person. We also discussed reading books with characters who make us mad because of the bad choices they make. Rump's inability to do the right thing made one member so upset that he could not finish the book. Isn't having an emotional reaction to a book, a good thing? Maybe not when it upsets you too much! 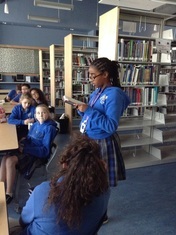 At this meeting students had to read a book written by a woman author in honor of National Women's History Month. 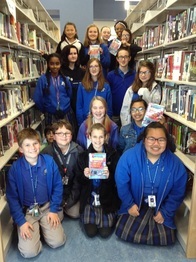 The books ran the gamut from young adult tear jerkers like Eleanor and Park by Rowell, dystopian novels like Allegiant by Roth, graphic novels like Nimona by Stevenson and Chi's Sweet Home by Kanata, and classics like The Giver by Lowry and the City of Ember series by DuPrau. 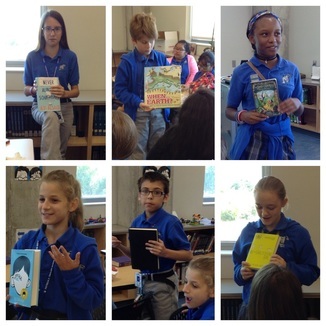 The students were passionate about the books that they loved. Even though not written by a woman, one student talked about Wonderstruck by Selznick being her favorite book of all time. It is hard to nix that comment as not fitting of the day's theme when the order of the day is to celebrate all beloved books and reading. On February 24th, BRiMS met to discuss the second book about the library lover, Mr. Lemoncello that was written by Chris Grabenstein. The first in the series, Escape from Mr. Lemoncello's Library was such a hit last year that the second one was sure to be a big hit, too. You don't need to have read the 1st in the series to enjoy the Library Olympics. Like its predecessor, it is filled with puzzles based on books that this age group might have read. The members of the group loved the puzzles, but did not always figure them out before the answer was revealed within the story. They claimed that it took too much thinking time away from the reading. Grabenstein added a 13th puzzle at the end that is left unanswered. The group did not find all the books to answer that puzzle, but they did figure out what types of books the author was looking for. The humor, the crazy characters, and the action make this book so appealing. ​you will see some of the members of BRiMS! 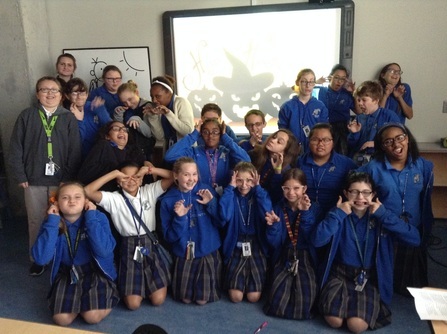 Students were given the task of bringing a book that either made them cry, made them laugh, or both. This made for a lively discussion as students agreed about the parts of a book that were sad, but some of the members took pride in never crying while others reveled in the tears as they were all consumed by a particular story. Favorites included the following books: The Series of Unfortunate Events' books with their major silliness and the ending of the series where Count Olaf's past was revealed; Harry Potter and the Deathly Hallows also spurred on great discussion of tears, especially with the recent demise of Alan Rickman who played Snape in the movies; and the Hunger Games trilogy was also a major player in the tears department with Rue's death and also with Finnick's. 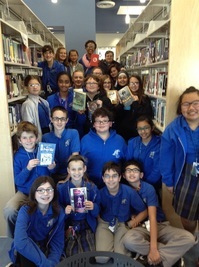 The Dork Diaries, Diary of a Wimpy Kid, Dear Dumb Diary, and the Scott Pilgrim series made students laugh. Other tear jerkers included The Fault in our Stars, the conclusion of the Divergent series, Maze Runner, and Messenger which was the second book in The Giver series. One student was sad because she had to wait so long for the 4th book to be published in the Land of Stories' series. Students were quite upset when favorite characters die, and one student said that she cried uncontrollably in One for the Murphys. 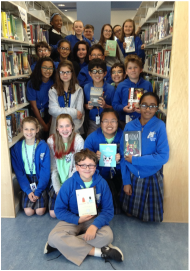 This BRiMS is a lively group of students who love to read, and their enthusiasm for books makes these discussions a lot of fun. This was one of the best discussions ever during a BRiMS meeting. Most of the students were not blown away by Sonneblick's Curveball. However, they could relate to the dilemmas that Pete faced. Having lost the use of his arm as a star pitcher, he heads into the grips of a new passion, photography, but this move is a rocky one. Especially, because he is haunted by the changes in his grandfather. The grandfather that taught him how to use a camera and hands Pete all of his equipment. It is his grandfather's dementia that gave us the most talking points. Students discussed aging family members, and how memory loss changed them. Then we moved to the topic of memories. Students loved sharing their first memory and memories of events that affected all of them such as Hurricane Katrina, ten years ago, and a rare winter snowstorm, seven years ago. Often real memories of these events were not there, but the students had photographs or the event was a family legend. Due to the nature of this discussion, almost every member was able to contribute and since each shared a very short story, there was time for each person to contribute. What do ghosts drink at breakfast? A. Coffee with scream and sugar. Why didn't the skeleton cross the road? A: He had no guts. We did have time for one student to share a scary story, too. 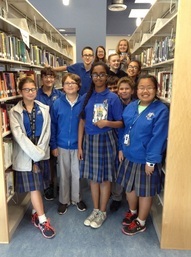 For the September meeting, the students read Flunked by Jen Calonita. Not only did they spend time talking about the book during BRIMS, but they had a chance to talk about the book with the author via skype. The students were reluctant to ask questions at first, but eventually there were so many questions that the skype ended without everyone getting a chance to talk. The students learned that Calonita likes to base characters on people she knows. Gilly is based on a girl who goes to school with one of her sons, but Maxine was not based on anyone, but is Calonita's favorite character. Her eyeball that spins is kind of intriguing. Calonita's favorite teacher at the Fairy Tale Reform School is Wolfington, and he was one of the students' favorites too. Calonita advice to the students is keep reading. This was the first meeting of the year for BRiMS. 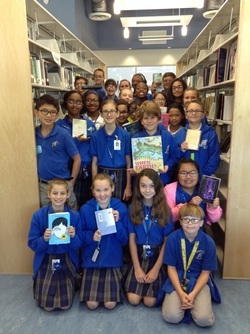 The students were asked to bring in a book that they read over the summer and loved. Some of those books included Wonder by Palacio, In the Land of Stories 1 by Colfer, Me, Earl and the Dying Girl by Andrews, Elsewhere by Zevin, and Alsaid's Never Always Sometimes. 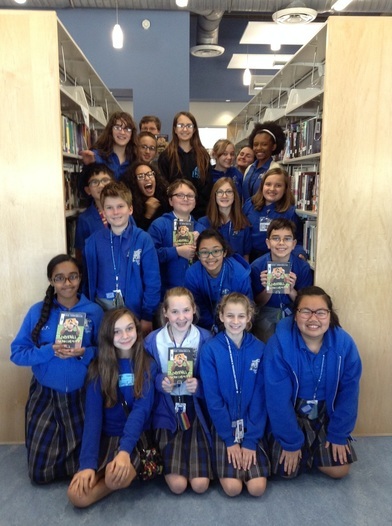 Students found humor, pathos, suspense, and good writing in all of their beloved books. Some gave their copiesto other members to take home to read. It was a great discussion with strong talkers and focused listeners.